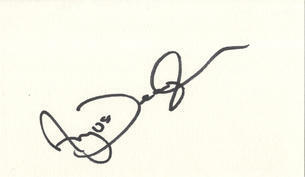 This is an In Person Signed White Card 5" x 3" by the English actor and comedy presenter. Gordon Angus Deayton (born 6 January 1956) is an English actor, writer, musician, comedian and television presenter. He is best-known as the former presenter of the satirical panel game Have I Got News for You, a job from which he was sacked in October 2002 after a second round of tabloid allegations about his personal life.